Alton Grizzle dazzled NAMLE conference attendees this past week with (among other things) the global and groundbreaking curriculum that UNESCO (United Nations Educational, Scientific and Cultural Organization) released earlier this month: Media and Information Literacy Curriculum for Teachers. What I find hopeful and inspiring is that Alton comes from the world of information systems AND he’s an educator. So he understands the integration and unification that has to occur across disciplines and industries. His is a peacemaking mission of sorts—and on a global level. 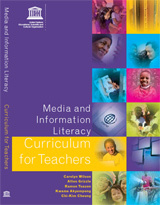 I appreciate that the curriculum takes a holistic approach to media and technology (“the convergence of radio, television, internet, newspapers, books, digital archives and libraries”). And best of all, it’s targeted to teachers for immediate implementation into the school curriculum, regardless of their geographical location. If you’d like to stay updated on this and other projects from UNESCO, I recommend subscribing to their newsletter. [Download Curriculum] [Subscribe to Newsletter].